Iqaluit is the capital of and largest community in Nunavut Territory in Canada. It is the most northerly capital in Canada, and is also Canada's fastest growing community. The name Iqaluit is Inuktitut word meaning "place of many fish". It is built on the mouth of the Sylvia Grinnell River, on Frobisher Bay. English explorer Martin Frobisher sailed into the bay in 1576 and thought he had discovered the Northwest Passage. The settlement was called Frobisher Bay from 1955 until 1987. The weather in there is normally cold. ↑ "MAYOR MADELEINE REDFERN". City of Iqaluit website, April 7, 2017. ↑ "Council Members". City.iqaluit.nu.ca. Archived from the original on 2011-05-10. Retrieved 2011-03-02. ↑ "Welcome to the City of Iqaluit". City of Iqaluit. Retrieved 2009-11-07. ↑ 9.0 9.1 9.2 "About Iqaluit: History". City of Iqaluit. Retrieved 2009-11-07. Data recorded at Iqaluit Airport for Environment Canada. Average data recorded over a 30-year span from 1971 to 2000. 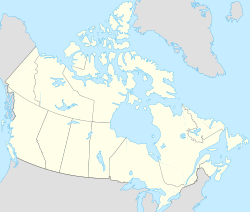 Wikimedia Commons has media related to Iqaluit. This page was last changed on 25 December 2018, at 03:01.